Over the last couple of months I’ve attended a number of really interesting and indeed innovative conferences. Whilst each was very different in terms of audience and speakers the message was the same – the future is all about conversations, relationships and integrity. From the Audiences NI annual conference which asked ‘What Next?’, to ‘Showcase’ a conference focussed on cultural entrepreneurship, and ‘Imagine Create’ a digital conference at the University of Ulster the message was clear, we can only succeed in this digital world by engaging with people on a human level. Andrew Hetherington from fundit.ie a cultural crowd funding project suggested that simply ‘sustaining the sector is dull’. Crowd funding on the other hand demonstrates that arts patrons have a role play, arts audiences thrive on participation and seek authenticity, fundit.ie provides a platform to facilitate audience engagement. Fundit.ie hosts a range of projects from the Irish Museum of Modern Art’s request for €4,800 to buy four drawings by artist Bea McMahon, to Le Cool Dublin Walking tours request for funding to support the development of their walking tours. But these organisation do not simply request the money, they pitch their ideas to their audience. Each request comes with a short video which tells you more about the project, the people and the idea. People that donate are not buying into a piece of art or an event they are buying into the people and ideas behind it. Rather than the donation marking the end of the conversation, it sparks of a new patron-organisation relationship. Organisations offer rewards to those that fund them from free tickets, to their name in a catalogue, these rewards not only encourage people to donate but it encourages long term engagement, it encourages people to leave their computers and to experience the art and culture which they have supported in real life. Perhaps the most unique presentation and indeed the most memorable of late came from the lovely people of Benburb. Benburb is a small village about 40 minutes outside Belfast, 5 years ago a group of artisans took over some derelict priory cottages and renovated them into craft studios and a restaurant. Benburb Priory Cottages, began their presentation by bringing in a range of locally sourced and home made products from cheeses to breads, carried in hand made baskets, and carved on hand made chopping boards. Their lasting message was simple but effective ‘we trade in emotions not money’, to be fair they did discuss their business model, and offered us the opportunity to buy some of their wares, but their emphasis on quality, authentic experiences and genuine conversations is what I took from this talk. Accessibility and experience was something that Evan Grant spoke about ‘You need to be able to bring in your 3 year old kid, and 90 year old granny- if they get it within a couple of minutes its truly accessible’ I thought this was a point real made, whilst we are all seeking to innovate, to create bigger and better experiences, sometime the simplest things are the most successful. What really interested my about Evan Grant’s work was the R&D focus of his company ‘Seeper’. Seeper puts 50% of its time and resources into R&D. Imagine if publicly funded museums and galleries could spend 50% of their time researching and developing new technology, the results would simply be fantastic! Innovation is something that Rohan Gunatillake from Edinburgh Festival Lab spoke about. 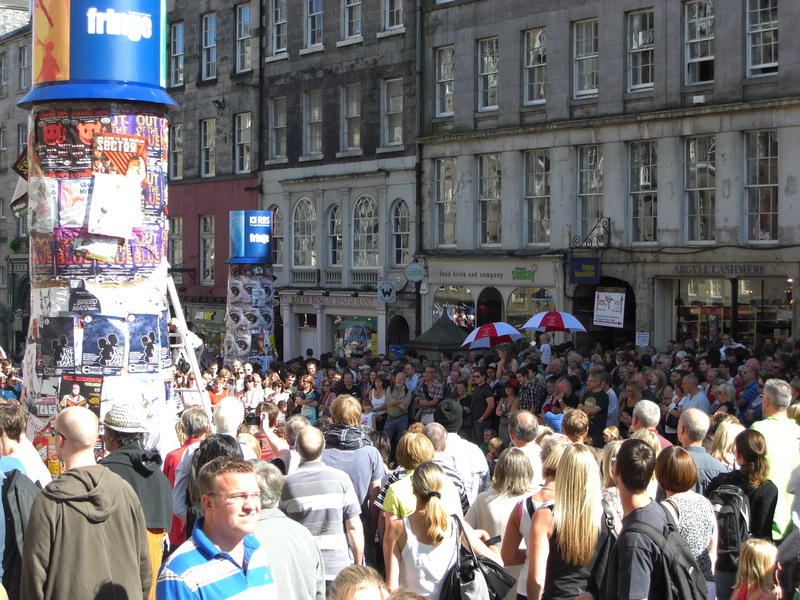 His organisation was set up as a research and development hub for Edinburgh’s 12 festivals. Festival Lab is tasked with encouraging innovation within the festival sector. They facilitate the productive breaking of the rules that guide practice, rules such as ‘we are a 2 week festival’ Rohan suggested asking well why are you a 2 week festival? Could you be more effective as a 1 week festival, or as a 3 week festival? Challenging the facts of who you are, and what you do can catalyst innovation. Having an external R&D lab is a luxury that most arts organisations are not privy to, Festival lab is however an exciting model that could be adapted and used by local arts forums, from museum tweet ups, to city wide festival networks. I think what I have taken from all these conferences and speakers is that to improve our digital offer we need to shut down our computers and make more of an effort to talk to the people we are creating for. We should exchange ideas with others doing similar work over a cup of tea, we should listen to those that we want to work with, we should ask open questions and be prepared for answers that might challenge our practice. We should accept that conversations can result in change, but that change can lead to innovation. We should know the facts that we hold dear, and the facts that we are willing to change from the date of our festivals to the narration of our exhibitions. The cultural sector from museums, galleries, festivals and theatre are no longer temples of the high arts, we now live in a crowd sourced, user generated world, and successful arts organisations are engaging with this new model of cultural production. Volunteering & lots of tea are a perfect combination! Fundit is probably the best Irish website in the last 10 years. I can’t get over how generous people are in this so-called recession!